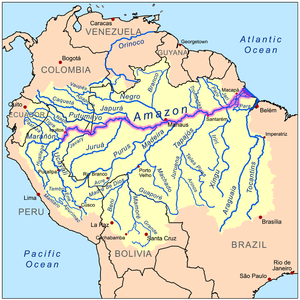 ... 1542 (470 years ago today), Europeans 1st set eyes on one of the world's great rivers, the Amazon, which cuts an east-west swatch of more than 4,000 miles through South America. 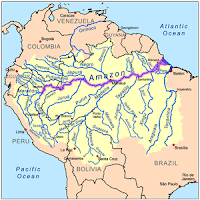 (map credit) The "discovery" occurred when indigenous peoples led a Spanish explorer who'd traveled inland from the Pacific side of the continent, navigating the River Napo. The explorer eventually traveled the Amazon to the Atlantic Ocean, then went back to Spain to report on all he'd seen.